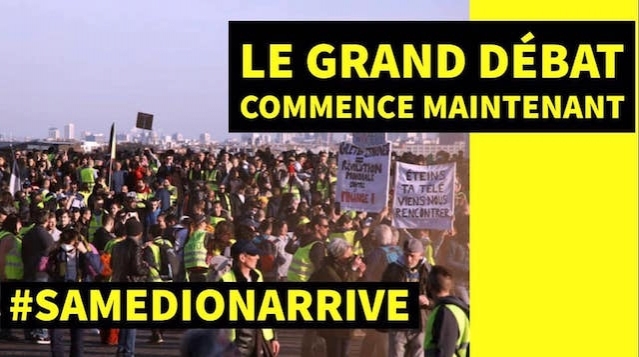 USPA NEWS - Today, "yellow vests" demonstrated today the 19th saturday, in Paris and elsewhere in France, acccording to the Ministry of the Interior, they wren 40,500 people, including 5,000 in Paris. According to the organizers they wren 127 212, in France. This is slightly better than the previous Saturday when the place Beauvau had counted 32,000 demonstrators throughout the country, including 10,000 in Paris during the act 18. 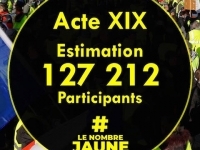 But it is far from the record of the "yellow vests with their own way of counting: according to them, 127.212 demonstrators were shown all over the country.A relative calm in Paris and a slight increase in mobilization throughout the country. A week after the looting on the Champs-Elysees and the measures of firmness announced by the government, Act 19 of the "yellow vests" was marked by tensions in the region and a parade quietly in Paris, by the end of the day, although the security Modus Operatic has been strengthen, since the dramatic consequences of the Blackblocks and vandals attacking and bring stores, and retail shops including the library kiosques and the replacement of the perfect Michel Delpuech by Didier Lallement whose motto is "No to endeavor anymore"
Today, "yellow vests" demonstrated today the 19th saturday, in Paris and elsewhere in France, acccording to the Ministry of the Interior, they wren 40,500 people, including 5,000 in Paris. According to the organizers they wren 127 212, in France. This is slightly better than the previous Saturday when the place Beauvau had counted 32,000 demonstrators throughout the country, including 10,000 in Paris during the act 18. 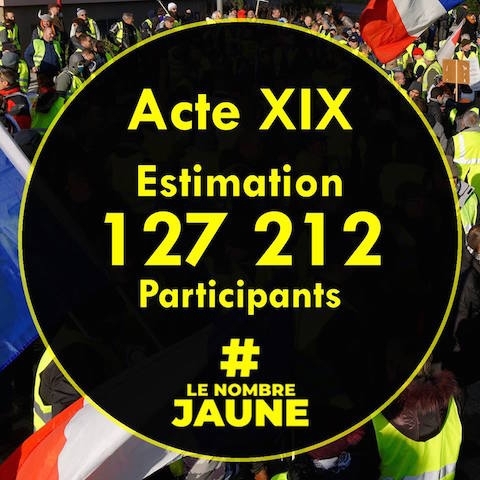 But it is far from the record of the "yellow vests with their own way of counting: according to them, 127.212 demonstrators were shown all over the country.A relative calm in Paris and a slight increase in mobilization throughout the country. A week after the looting on the Champs-Elysees and the measures of firmness announced by the government, Act 19 of the "yellow vests" was marked by tensions in the region and a parade quietly in Paris, by the end of the day, although the security Modus Operatic has been strengthen, since the dramatic consequences of the Blackblocks and vandals attacking and bring stores, and retail shops including the library kiosques and the replacement of the perfect Michel Delpuech by Didier Lallement whose motto is "No to endeavor anymore" Today, "yellow vests" demonstrated today the 19th saturday, in Paris and elsewhere in France, acccording to the Ministry of the Interior, they wren 40,500 people, including 5,000 in Paris. According to the organizers they wren 127 212, in France. This is slightly better than the previous Saturday when the place Beauvau had counted 32,000 demonstrators throughout the country, including 10,000 in Paris during the act 18. 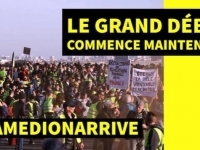 But it is far from the record of the "yellow vests with their own way of counting: according to them, 127.212 demonstrators were shown all over the country.A relative calm in Paris and a slight increase in mobilization throughout the country. A week after the looting on the Champs-Elysees and the measures of firmness announced by the government, Act 19 of the "yellow vests" was marked by tensions in the region and a parade quietly in Paris, by the end of the day, although the security Modus Operatic has been strengthen, since the dramatic consequences of the Blackblocks and vandals attacking and bring stores, and retail shops including the library kiosques and the replacement of the perfect Michel Delpuech by Didier Lallement whose motto is "No to endeavor anymore"
A QUITE YELLOW VESTS PROTETS COMPARED TO LAST WEEK END DEMONSTRATION OF EXTREME VIOLENCE The demonstrations planned under act 19 of the yellow vests this Saturday, March 23 had been highly valued as another test for the government, after the violence that had erupted during the previous mobilization, under extreme violences last Saturday. The 19th act pf Yellow Vests Protest was « calm », yet marked by some incidents, in Paris and elsewhere in France. There have been more than two thousands of people arrested since November 17th the First Act of Yellow Vests Protests.--------------------------------------------------------------------------------------------------------------------------------------------- In Paris, the demonstrations on the Champs-Elysees and its surroundings were banned, this did not stop people from going to the forbidden perimeter, which led to police verbalization. 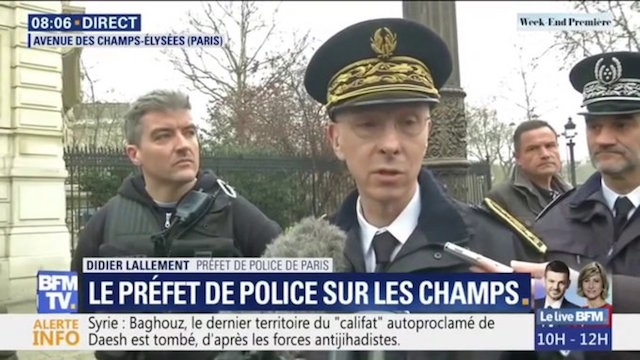 The official Parisian mobilization, which went from the Denfert-Rochereau square to the Sacré-Coeur, took place in calm. Tensions erupted during the dispersal of the procession, which led the police to use tear gas. Place de la République, a policeman has a cardiac arrest. 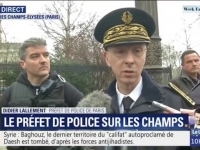 His discomfort is not due to a confrontation with the yellow vests and he was transferred to the hospital in a "very serious" state. In the regions, tensions between protesters and law enforcement have also erupted in many cities such as Lyon, Toulouse, and Lille. In Nice, where dozens of yellow vests gathered in the morning in the Garibaldi Square despite the prefectural order, 80 people were arrested and a woman was injured.